It’s a yearly habit to travel to Lauda-Köningshofen for the Keep It True Festival, already the fifteenth (!) edition. Thank God Oliver organized a ‘Metal Assault’ Festival in between, it made the waiting less harder and it gave me just the kick I needed in the long time waiting for this best festival on earth. Anyway this was an edition to look especially forward to because a Belgian band was scheduled named - Ostrogoth! True fact is that Killer was the first Belgian band ever that played a full gig at KIT. Okay, After All did a short guest performance before thanks to Agent Steel and Kate from Acid played one of her songs before but this year Ostrogoth was ready to give all the present Heavy Metal maniacs a very pleasant not soon to forget.. Other than that it was again a long trip on a short time, thanks to those fantastic – no speed limit – German Highways. It was heading again to those picturesque villages with their ancient churches, little creeks and typical old houses. It felt like we never ever left the Tauberfrankenhalle when we entered it again. A very strange feeling because it was exactly a year ago and meanwhile life went on, it goes fast! Feels like coming home? I suppose so! The international crowd was present again and after so many editions you already know who you can expect there. We arrived late as usual and so we missed the first bands on the bill; PORTRAIT and CAUCHEMAR. Sorry for the fans who wanted to know how their favorite bands performed. 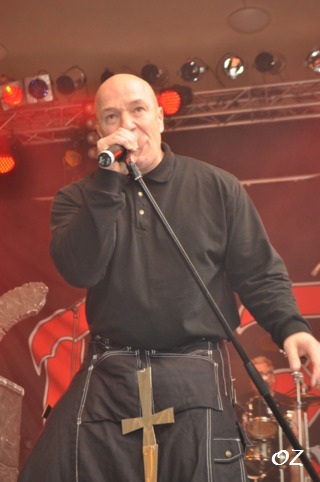 The first band I saw was WITCH CROSS, a Danish obscure Metal band from the eighties. I’m not as familiar with the band as hundreds others were in the hall but I saw a band that was alive and kicking! As far as I know the band only released one official album but we can only hope the bands stays reunited for more. “Lights From Oblivion” is the third and brand new album of the Italian Epic Progressive Metal band ADRAMELCH. These Italians are exceptional if we talk about European Heavy Metal. Their epic touches, medieval sources of inspiration and especially their love for the more US style of Progressive Metal is adored by me and this public. Fans of the older Fates Warning should love this band and I can only say they’re also on stage worth to check out. We talk about a very experienced band here, their first album “Irae Melanox” – a masterpiece by the way- was already released in 1988 and it took the band until 2005 to write the second one. From both albums and of course from the newbie songs were played and it was more than exciting to see these guys on stage. Although Italy is an European country they are difficult to see around here. First band I was really looking forward to was OZ. This is one of those bands that deliver me some youth sentiment and their album “Fire In The Brain” has everything to do with it. So it was obvious that the band opened with “Search Lights” to set the German public on fire for the first time this year. Followed by lots of other awesome Heavy Metal tracks the band didn’t disappoint at all, although I was warned for it. No, this was a very good gig with Finish lads who still know after all these years how to perform on stage! Ape De Martini still contains that special timbre and it was no problem for me to sing along. I also witnessed two fantastic guitarists, wow! The band reunited after so many years and “Burning Leather”, their last effort made me relive old times. Oz is back! MYSTIC FORCE was the ultimate US Metal band I was looking forward to this year. The advantage of this kind of festivals is that fans got the chance to see unique performances on stage. I suppose Mystic Force doesn’t ring bells to many Metal fans but if you’re into US Metal you should know their classics. We’re talking about the EP “Take Command”, my favorite album of the band “Shipwrecked With The Wicked”, “Eternal Quest”, “A Step Beyond” and “Man vs Machine”. As a matter of fact these American Progressive Power Metal musicians already have a rich career but it never brought them the respect they deserved. A typical story when we talk about US Power Metal and therefore this gig was even more unique. The band took off and immediately it felt right! I really enjoyed this concert and I was enjoying these fast fingered leads, fantastic drums and powerful bass, a very good singer! he band was energetic and no one can deny that Americans have that something ‘special’ when they’re on a stage. This gig demands for more! Especially fans of bands like the old Queensryche, Lethal… should have seen this! I can only hope the band will work on new material. Meanwhile “Take Command” is re-issued with lots of extra songs and some musicians of Mystic Force are in another band called Fallen Martyr, an album I will talk about in a review. Afterwards I met Keith Menser (bass) and he was more than satisfied, even talked about moving to Europe! Anyway Keith, when you read this; thanks a ton for this great show, another one that is branded in my mind! This is one of those irreplaceable, even ‘once in a lifetime’ gigs and I totally enjoyed it! SLOUGH FEGG is a ‘yes or no’ for some Metal heads I suppose but no one can rebuff this band contains very good musicians. The band released several albums but is still labeled as a ‘cult’ band, a rather demanding band to get into. Their obscurity has a lot to do with their special kind of Metal I suppose, not always the easiest music to get into. Nevertheless I saw the band several times before and they keep on managing it to bring their stuff, as hard as a rock, on stage! This band stands tall and didn’t have any difficulties to convince the crowd again. I suppose they never will in Germany, the country that contains most Slough Fegg fans of the world I suppose. A reunion the most visitors were looking forward to was without any doubts the Canadian band SWORD. After the release of two fantastic albums, so many many years ago, the band vanished. I suppose no one ever believed that SWORD could ever come back and see… These Canadians came on stage like they have never ever disappeared, what a reunion! 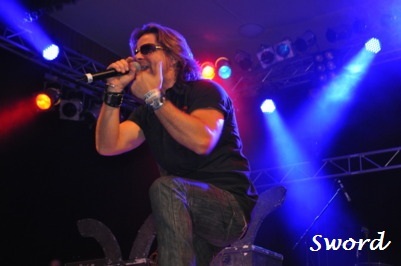 It’s often hard, even painful to see a reunited band but that doesn’t count at all for Sword! SGuitars, drums, bass, the songs, the leads… Just perfect or what can I say? And Rick Hughes? What a singer! It seems like time couldn’t lay its hands on him and his vocal performances really were fantastic! The band played their best songs and set the entire hall on fire! Only this band was already worth travelling so many kilometers! With tracks like “Outta Control”, “Prepare To Die”, “Land Of The Brave”, “Evil Spell” and of course “F.T.W.” nothing could go wrong, especially when you see the band is in a great shape! Day one of this mighty festival ended with US mystical Progressive Power Metal band PSYCHOTIC WALTZ. I saw the band earlier this year and their reunion wasn’t the big success to me, in my opinion they were pretty boring in Antwerp. Now a headlining show was in front of us but I was told it would be an ‘old school show’. 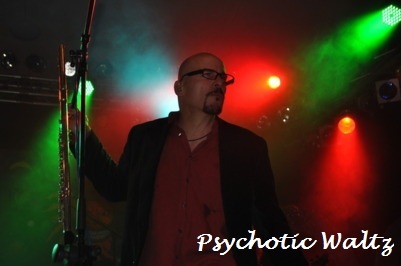 Well, Psychotic Waltz did what they had to do as the leading band of the day and brought us a very good concert. 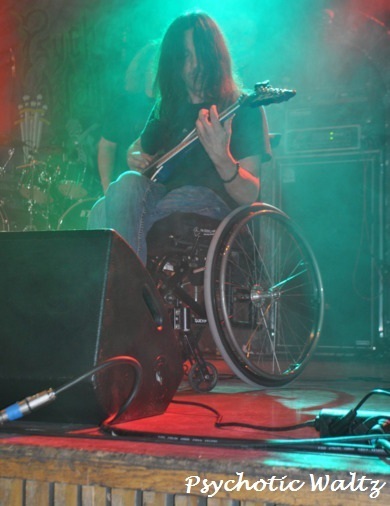 All classic songs from their four albums were delivered and it stays strange to see a guitarist in a wheel chair on stage. Nevertheless I bow my head deep for this man because he’s a fantastic guitar player and performer. “Morbid”, “Faded”, “Mosquito”, “...And The Devil Cried”.... These are the songs I wanted to hear from this awesome band and they just delivered what the crowd and I wanted! Will they ever release a new album? I really hope so because PSYCHOTIC WALTZ is far too good to disband. Lots of beers on day one means even more coffees on day two... and so I saw my friends consuming one after another one. Headaches, little and tired eyes, hanging around wherever possible.... These are the consequences but meanwhile I visited once more that fantastic Metal Market on this festival, searching for rare CD’s or bargains. VOLTURE took place on stage and after the release of their well tasted mini-CD I was curious to see these guys. High pitched vocals, strong heavy Metal, a perfect way to finally rise and shine. FUELED BY FIRE was for the second time on the Keep It True Festival. These American youngsters, looking like they’re right out of Brazil, play an important role in the modern Thrash Metal scène. Along with other new bands they are trying to re-live those mighty Eighties although I suppose they realize those days are definitely gone. Nevertheless these kind of bands are popular and not only by the youth. 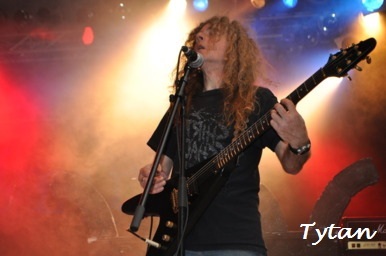 Their true kind of Thrash Metal is energetic and demands the first sweat of this international crowd. Sweat? Oh yes because it’s summer here in Germany, while 500 kilometers further it’s raining cats and dogs. It’s a hot day and Fueled By Fire gave the perfect excuse to drink even more. SENTINEL BEAST was also for the second time on the festival but a few years ago Debbie Gunn was forced to search some young musicians to join her. This time she succeeded to bring the original band to Germany and it was obviously these guys didn’t regret it for a second to travel all over the ocean. Almost the entire “Depths Of Death” album was performed! OSTROGOTH is a band from my hometown and I saw this band plenty of times in the Eighties. You only realize what you miss until it’s gone and after the disbanding of Ostrogoth! I really discovered how original this band really was. The double bass drums, the double leads... Nowadays it is common but in the very early Eighties only Maiden, Priest and a few others really used it. It was cool to see that the band reunited for the Metal Of Ages Festival last year but I can assure you I was very disappointed, especially in Marc, the original lead singer. No matter how fantastic his voice was so long ago, on this particular festival it was painful to hear. I suppose the band realized this weakness and searched for a new singer, Josey was found. This man, from the West part of Flanders seemed to be a very friendly guy when I talked with him the day before. A bit nervous, telling me he’s actually an AOR / Rock singer, containing a voice in between Peter De Windt and Marc De Brauwer. It even made me more curious because Ostrogoth has the major responsibility to show what Belgian Metal is really about. Along with Cyclone, Crossfire, Acid, Killer, Target and the old Channel Zero - Ostrogoth colored the Belgian Metal scène and when the Greeks are fond of them, we really should be too more. A mysterious intro and BAM! There was Ostrogoth as they have never ever been away! “Heroes Museum” is a perfect way to start, a track from one of the best EP’s ever released! Frodo and Rudy, both guitar players seemed to be in a big shape and one after another familiar riff and solo are heading our way. Meanwhile Mario “Grizzly” is behind the drums and it all seems so easy for the man who stood at the cradle of sharp played technical double bass drums! Respect Mario, respect! And our new singer? Well, ladies and gentlemen, he’s a very good replacer for both previous vocalists but contains indeed his own vocal sound. He’s intelligent enough to sing around the high screams but solves this ‘problem’ on his own way, on a way you can only like what you hear. Nobody was comparing with the original after the show because they were too impressed to hear what this man performed, how he achieved and how he was able to set the front rows of the hall on fire! “Ecstasy And Danger”, “Paris By Night”, “Full Moon’s Eyes”, “Queen Of Desire”... they all sounded the way they should! 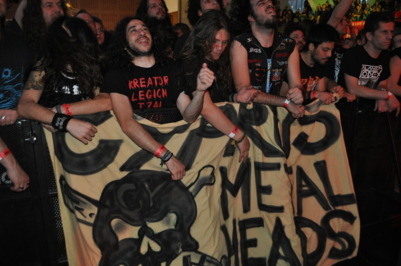 I saw the international crowd going wild and that made me proud as a Belgian Metal head! After the show we told these lads how strong their performance was, how many reasons they had to be proud! 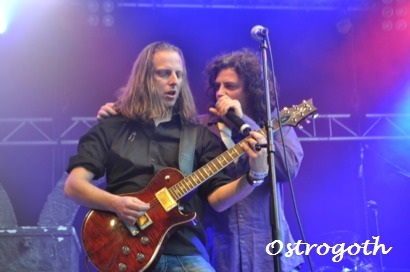 Ostrogoth will write new music, awesome! We will be back at the next Belgian gig! WHIPLASH is another band that performed on this festival before but I missed that edition. It was anyway a chance to see the band again although I admit I’m a fan of their third album, ”Insult to injury” but I didn’t expect them to bring it today. I suppose the high pitched vocals has anything to do with it. On this gig it was clear the first two albums were wanted, the reason why the band owns the status of another cult Thrash Metal band. So, from “Power And Pain” and “Ticket To Mayhem” the most songs were played and the result was one hell of a mosh pit after another! Thrashing from begin until the end, that was the main reason why Whiplash visited Germany and they succeeded, the crowd thanked them for this pure Thrash Metal feast! I bought the “Epitaph” CD from TENSION especially for this edition of the Keep It True festival. A band, with old time roots, delivering what True Metal bands are long for. The origins of this band can be found back in the late seventies but ever since the band only released two CD’s. 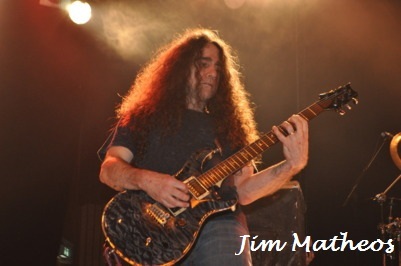 Unfortunately Marty Friedman (!) wasn’t on stage, we received a good old school Heavy/Speed Metal show. This band is still dynamic and the crowd embraced them with all of their hearts. The band seems to have future plans and that’s good to hear. Great show! Although I’m not familiar with them TYTAN seems to be a band lots of the visitors were waiting for. The original singer Kal Swan was absent but it seems most people didn’t really care about it after this show. The band appeared on stage with 3 guitar players, a bassist, keyboard player and of course a drummer and so the stage was pretty crowded. What I heard was first class melodic Metal and although the band feared they weren’t heavy enough for this festival the public really loved them, so did I. This was a good performance with a very good singer. Since ANVIL released their DVD about their story we can talk about a true ‘come-back’. Young people respect them for what they did, older fans re-discovered them. Anyway I am only a fan of their first three releases, the later works were not bad, not always that good enough to be wild about them. Not only the fact Thrash and other genres became immense popular, instead of traditional Metal, was the reason Anvil couldn’t kept their rather mainstream success. Although Lips and Robb, probably the best drummer on earth, worked very hard they couldn’t release masterpieces anymore. 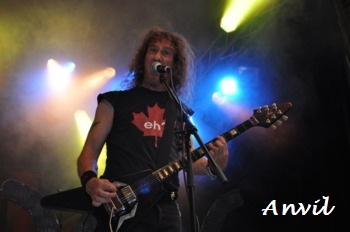 Anvil was today Anvil as we know them, a good live band but I saw them better before. The band really enjoyed their performance and this public was enthusiastic, ain’t that the most important? For the second time a NWOBHM tribute was foreseen at the KIT Fest. I remember how overwhelming it was the first time so I was expecting a lot from this one. Again ROXXCALIBUR was the guiding band, again guest musicians from our old favorite bands would enter the stage, one after another. Opening with a Jameson Raid track was the perfect intro to make this singer the presenter of this special Heavy Metal party. One after another old hero came on stage and I remember tracks from Gaskin, “Heavy Metal Mania” from Holocaust, “Let It Loose” from Savage and “Princess Of The Night” from Saxon! The crowd went wild on these old hits but the most beautiful present was kept for the end when Dennis Stratton from Iron Maiden entered the stage. 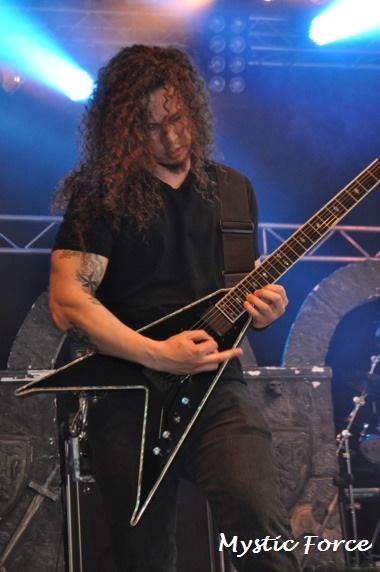 This man was the second guitar player on the very first album, a classic one in the entire Heavy Metal scène. With “Prowler”, “Remember Tomorrow” and of course “Iron Maiden” the whole place was on fire! 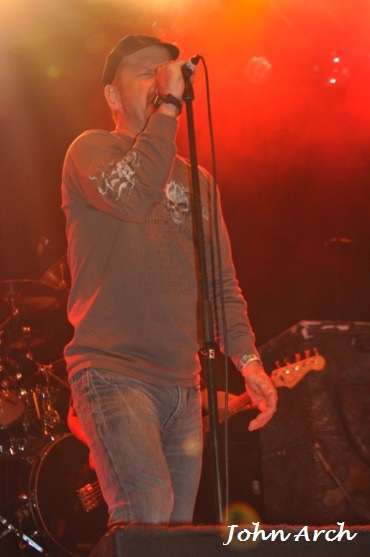 Everybody was singing along, Dennis Stratton obviously enjoyed himself on stage! This felt like a ‘déjà-vu’ and I can only hope ROXXCALIBUR will tour one day throughout Europe with this idea! Thank you so much for bringing this! And so this fifteenth edition of the Keep It True Festival ended in beauty! 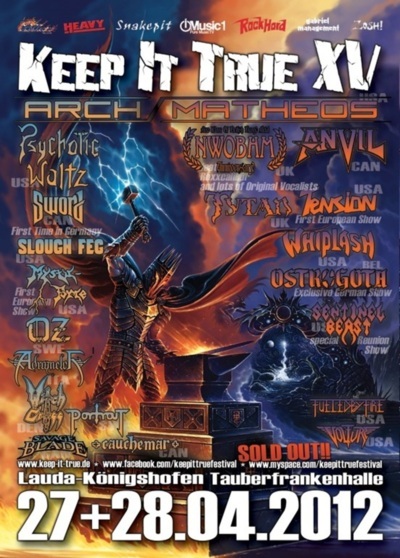 It was once more the ultimate kick for fans of True Metal and I can only advice you to buy as soon as possible tickets for the next edition because it will be sold out very soon. I promise it will be worth travelling so far, no matter from where in the world you’re coming from! The headliners are not known yet, although the rumors sounds promising but with bands as STEEL PROPHET, JACK STAR’S BURNING STAR and MEDIEVAL STEEL I suppose nothing can go wrong. See you next year!